A small Toledo, Ohio church has jumped to the top of our Most Inspiring Churches list (Well, second from the stop…). 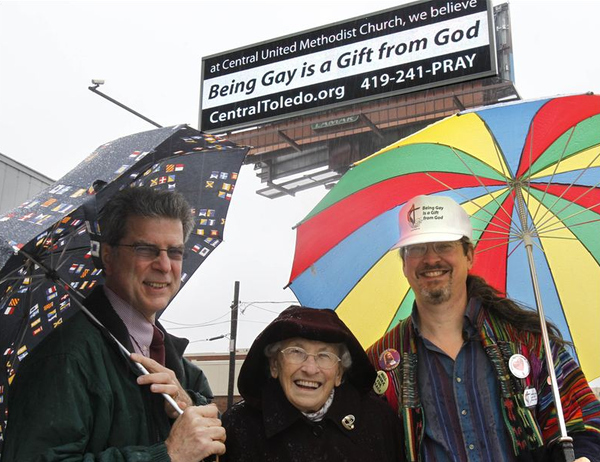 Central United Methodist Church has begun displaying a controversial message on a billboard in downtown Toledo. “Being Gay is a Gift from God.” Amen! The decision to put up the message came about after the string of high-profile suicides across the country by gay teens over the past year. Central United Methodist wanted to make sure no Toledo teens would meet the same fate. But not everyone is receptive to this church’s message. The Rev. Scott Ocke, pastor of Maumee United Methodist Church, is among those who disagree with Central’s billboard message. While that same old hateful swan song will continue to be sung for the foreseeable future, it brings us great pride and joy to see churches like Central United Methodist and Douglass Boulevard Christian Church, who stopped signing marriage licenses until gays can marry legally as well, stand up for their LGBT parishioners. Keep up the good work, y’all! Hallelujah! True of False: Being gay is a gift from God?